Any new art exhibit in Omaha that comes from south of the border naturally raises certain expectations of work rich in Mexican heritage and socio-political issues from such masters as Jose Orozco, Diego Rivera and Frida Kahlo. But cultural and national issues aside, artists the world over share similar interests and concerns dealing with form, vision and process as much as content. Such is the case with Sorcery, a new exhibit at the Moving Gallery in the Garden of the Zodiac venue in the Old Market Passageway. Organized by Humberto Chavez, joint academic director of Mexico’s National Center for the Arts, Sorcery continues through June 23 featuring 41 prints from six artists whose work is more experimental than thematic. The exhibit is composed of recent printmaking from the Independent Artist Workshop of the Center of Education and Production in Graphic Art “La Parota.” It includes work from its director, José Antonio Castillo, as well as César Burgos, Daniel Fernández, Eduardo Ovando, Mónica Saucedo and José Sulaimán. “La Parota” offers its participants the chance not only to refine printmaking techniques but to experiment within the medium as well. “La Parota” is a magical place, curator Chavez says in his show statement, where “a circle of artists play, question and offer multiple meanings, quests and solutions, in terms both formal and conceptual.” This would explain his title choice for the exhibit, Sorcery, which he says should hold the viewer in a spell-like kind of “ritual of apparition, the discovery of the internal in the external.” Whether you eventually become spellbound or not, the external makes the initial impression as the exhibit is virtually a survey of print styles and forms from Sulaimán’s woodcuts and mixed media prints of Castillo, to the bodyprint monotypes of Burgos and the imaginative etchings and engravings of Fernandez, Ovando and Saucedo. Beyond that, the “internal” connection to Sorcery is more of a challenge from the more overt to the decidedly obscure. Chavez, the photographer and installation artist as well as educator, has made a career out of his own interesting experiments with the illusion of time and space, including his evolving work Tiempo Muerto , which he exhibited in Omaha in 2006 at the Bemis Center for Contemporary Arts. Chavez is a sorcerer; that is, the artist who casts a spell not through witchcraft but by exploring that twilight zone between the real and the unreal where one’s point of view is colored by desire, emotion, even memory. His own art is less object and more the subject of introspection and discovery without clear resolution. As visually interesting as it is, the experience is holistic and often disconcerting, but never predictable. The best, most interesting work in Sorcery has a similar effect. Castillo offers some of the most sophisticated work here with two series of prints, one a set of four etchings (1990) and the other, 16 mixed media from 2004. Both sets are quite conceptual but the former is more universal and cosmic with titles such as Ego, Eclipse, Angel y Venado and Aquila-mariposa. Each image resembles cave paintings from some developing civilization, evolving as the series progresses. In the foreground is some sign of order and design, at first metaphysical as in the circular maze in Ego and each on a background etched with shadowy figures or sprites. And then in Angel y venado and Eclipse , figures begin to emerge in the forefront and take shape as they override the spirits behind, and the super sign of the maze disappears. Evolution continues as Man begins to put his mark on the spell of chaos that spawned him. Flash forward to 2004 and Castillo’s eight Brujo and eight Bruja prints, part textual, part anamorphous imagery depict a civilization, however advanced in its language skills, still locked in left brain/right brain struggle to determine reality and truth. Saucedo and Fernandez also offer more abstract and conceptual prints with their engravings that reference architectural drawings or schematics. More so for the latter as his Entendimiento del mundo and Estableciendo relaciones look like authentic “treasure maps,” first drafts of great schemes and imaginings and grand adventure. Saucedo’s colorful Fluidos i s less imposing but its tear or rend in the fabric of its ordered universe may be the one piece in the show that deliberately breaks the spell others have attempted to cast and, for that alone, it is interesting. The etchings and engravings of Ovando are the most deliberately land- or cityscape in Sorcery , but they aren’t entirely what they seem, either These aren’t simple map quests or urban studies. Ovando is arguably the most socio-political in the group as he effectively combines a pleasing pattern with the occasional smudge and busy network. The result is images that comment on urban blight and bad city planning. This is especially true of Acidografia/Iceberg and Hallazzo/Carcelero where the city is slowly enveloped by its own waste and over-development and about to collapse under the weight of an underground labyrinth. As social commentary, these striking environmental studies depict a sorcerer who has created an urban nightmare, risked follie de grandeur and is about to pay for his grand illusion. 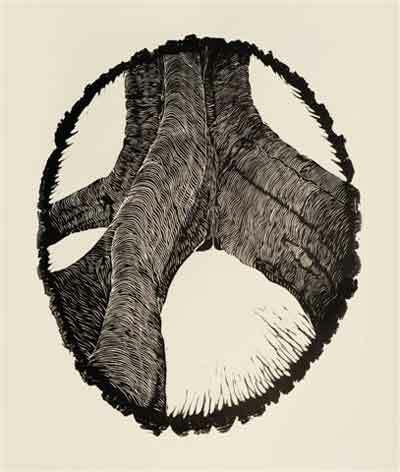 Leaving the city aside, Sulaimán ventures into the woods, and at first glance his woodblock prints, so like charcoal and pen-and-ink drawings, appear to be the most primitive here, particularly as they are all of tree trunks and limbs. But this is an illusion, albeit a simple one, as this more preternatural imagery is deliberately figurative and anthropomorphic, a sort of beauty and the beast. Atavio de hechiero and Ojiva sport gaping orifices on thick, gnarly bark that seem to speak directly to viewers. Conversely, Febril and the more obvious Omnisciente are more sinewy and seductive, the former posed and modeling and the latter spread-eagled and inviting. Sulaimán the sorcerer, yes, but just detached enough to create each image within a carved, decorative circle, like Victorian silhouettes, treating his wood spirits more as specimens than subjects. Arguably the most figurative yet elusive works in his exhibit are the body prints of sorcerer Burgos. Because of the nature of this beast, each untitled piece combines the gestural quality of finger painting with the ephemeral surface of a Rorschach ink blot. In that sense, these prints defy classification and interpretation. Look and turn away and one simply can’t get a fix on them in memory or the mind’s eye. Look again and these spectres will have changed form. Overall, Burgos’ monoprints serve as signature pieces for Sorcery because, though they too began materially, they exist now primarily due to the power of suggestion and the imagination. Sorcery continues through June 23 at the Garden of the Zodiac Gallery in the Old Market Passageway, 1042 Howard St. For details, times and schedules contact 402-517-8719 or vmercer3@cox.net.